Moonshine Madness is one of many top shelf sauces produced by Louisville, KY's Bourbon Q. The company started simply with a general store and catering business. Their reputation for quality meats and BBQ grew steadily within the region prompting BBQ competitions to reach out to the Bourbon Q gang. Shane Best (Pappy) and crew racked up numerous awards, including a World Invitational Rib Championship (Richmond, VA). After several successful years on the competition circuit, Pappy began developing his award winning sauces and seasonings for retail sale. Equaling (and perhaps surpassing) their competition success, Pappy's line of Kentucky bourbon infused sauces have won numerous awards from all the major sauce contests. Prizes from ranging from best packaging to best specialty sauce continue roll in for Bourbon Q. Bourbon Q's diverse line of sauces continues to grow. However, my first encounter with this brand was with one of their original recipes, Pappy's Moonshine Madness. Like their other sauces, Moonshine Madness is packaged in 12.7 oz. glass flasks. As I've said before, the glass flask is definitely my favorite means of packaging for BBQ sauce. This sauce has won numerous accolades for packaging and it's easy to see why. The thin, red sauce looks great in the bottle and the label is very appealing. Pappy's is quick to point out that Moonshine Madness is NOT as hot sauce. It's simply a REALLY HOT barbecue sauce. In fact, it's probably the hottest BBQ sauce I've every tasted. 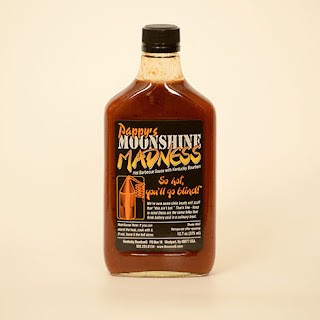 While featuring several standard BBQ sauce ingredients such as tomato paste, sugar and vinegar, Moonshine Madness also contains scorching hot habaneros AND oil of capsicum. The result is a fiery fusion of flavors that lies somewhere between the world of hot sauce and BBQ. Since Moonshine Madness is on the thin side, I first decided to use the sauce as a dip for chicken. This was a mistake that I paid for throughout the evening. I can generally hold my own with most chili heads when it comes to spicy foods, but one bite of meat fully submerged in Moonshine Madness was enough to put me out of commission. For my own tastes, Moonshine Madness is definitely too hot to use as a dip. After a couple of days, I worked up the courage for a second try. This time, I heated the sauce and brushed it on both pork and beef as it finished grilling. I quickly realized that this was the appropriate method for enjoying Moonshine Madness. Cooking the sauce on the meat mellowed the heat just enough to enjoy the sauce's sweet and tangy flavor. Don't get me wrong. The heat didn't disappear. However, the beast was tamed just enough for the burn to be enjoyable. You can get the whole Bourbon Q story and purchase a bottle of Moonshine Madness for yourself @ www.bourbonq.com. 2 Response to "Pappy's Moonshine Madness Barbecue Sauce"
I have 3 bottles of this stuff, and keep it stocked. Use it a lot as...yes...a dip, for my chicken nuggets but also brush on baked/grilled chicken as well. I have also used it in my homemade chili which is fan-freakin'-tastic. 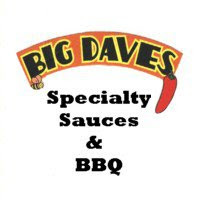 One of my all time favorite bbq sauces! Pretty versatile and the flavor/heat combination is fabulous.